Expensive pieces of glass that exist in front of your camera body, and arguably the most neglected part of a photography purchase. Lenses are what your camera uses to see the world. 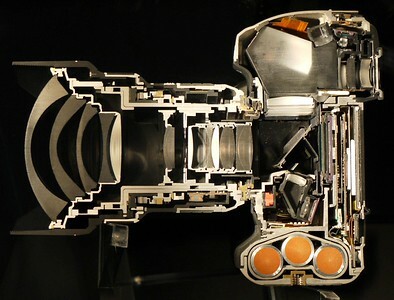 They are analogous to the internal lens of the eye, and the camera body the stuff behind the lens, with the important part being the retina i.e. sensor. Your retina will only see as good as your eyes make the world out to be. Optical distortions due to aberrations in your eye lead to fuzzy images that require glasses. A similar principle can be applied to lenses. Good lenses have good optical quality, image appear clear. Poor lenses have cheap optical quality, poor design etc leading to less than stellar images. But what makes a lens? Above are 2 diagrams. Diagram 1 is a very nice midline cut along the entire length of lens and body. From here you will be able to visualise the individual lens elements, of which a lens has many to refract light so that all the light rays coming from the outside world become compacted onto the size appropriate for its intended sensor. In this case, this is a full frame sensor. These lens elements are at times clustered into what are called 'groups', hence you may see advertisements go '10 elements in 4 groups' meaning there are 10 elements, some of which are clustered together into groups, of which there are 4 in total. 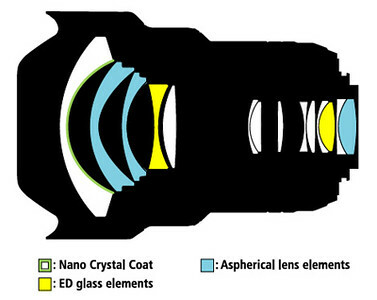 Diagram 2 provides another view of the lens, highlighting its elements, and also the placement of special lens elements. There are many different types of lens element shapes and styles e.g. aspherical, with special coatings that manufacturers have e.g. flourite coating, nanocoating, multicoating etc. They all have one thing in common: trying to avoid phenomenon such as flare and ghosting, all of which degrade the image, and are difficult to remove in post processing. These coatings and lens elements don't come cheap though, and usually attract a premium. Increased number of lens elements are usually a sign of the manufacturer trying to correct image distortion in lens, however this doesn't always necessarily mean the lens will be a good one. Often more lens elements will lead to increased flare, because light has to pass more lens elements, and each time light has to pass an element, it will lose some intensity due to reflections, which when internal bounce of other elements. This phenomenon is reduced by additional coatings on the elements. There are many factors that make up a great lens. - Optical construction and coatings - as briefly discussed above. These will all lead to the final output of the image, and dictate how sharp it projects the image onto the sensor. - Autofocus type - New ultrasonic/HSM motors are significantly faster and quieter than the lower end motors which are based on brushless designs. You will rarely find these kinds of old generation autofocus motors these days, so this shouldn't be an issue in most cases. -Vibration Control/Image Stabilisation - Measured in Stops gained, where more stops means better image stabilisation, more and more lenses and even bodies are being developed with this technology, which in effect moves a lens element within the lens to compensate for lens vibration, and negate its effect. Image stabilisation has progressed substantially where it first started off, for example where the VC/IS now will actually not compensate when horizontally panning, so you can take pictures of fast moving objects and get the desired background blur without losing vertical stability, which the VC/IS will counteract. Further enhancements include more than horizontal and vertical shake counteracting, with VC/IS now often able to counter rotational movements! The benefit of all this? Better low light photography where one can take images with lower shutter speeds yet still be correctly exposed. NOTE however, that VC/IS will only help vibration/shake, but if the object you are shooting itself moves, it will still result in image blur. You might ask, if photoshop can enhance an image, why do we need a good lens that can produce sharp images? The answer is simple: you cannot make detail. All photoshop and lightroom can do is sharpen the image, not create detail without advanced tinkering. From a sharp image, you can blur elements as needed. The best way to judge sharpness is go online and read reviews of lenses. The reviewers often put images up of shots taken from the lens are varying apertures and focus distances. This then can give you a good idea of how sharp the lens is. However, lens sharpness is not that simple to measure. Issues such as field curvature mean that there will be areas of the image that are out of focus, but while others are in focus, with these regions being often irregular shaped e.g. shaped like a doughnut. Sharpness is also varying across a frame, with the centre being the sharpest, and decreasingly sharp as you move towards the edge of the frame. This is mainly what separates expensive from cheap lenses - Frame to Frame sharpness. So when looking at an image, don't bother with the centre; of course it's sharp! Look at the corners of the frame. Here is where you'll see the true failings of the optics of a lens. Corner to corner sharpness is more important in landscape photography. In conjunction sharpness, we must consider how the lens renders out of focus elements. This is termed bokeh. This is an advanced area of lens critique, google is your friend, with this area of photography still hotly debated and very arbitrary. What one defines as good out of focus elements i.e. bokeh varies from person to person, but general consensus, is that creamy out of focus regions are desirable. Associated with bokeh is the concept of depth of field. In general, faster lenses i.e. larger aperture (bigger iris where light can enter the lens) produce better DoF, and hence separation between the object of interest and the surrounding. This often has aesthetically pleasing results, and is used extensively in portraiture photography. However, a shallow depth of field can often detract from photography when abused due to poor subject and scene selection. The benefits of a faster lens though are most apparent during low light photography. The camera needs to autofocus, and does this by seeing through the lens. Larger apertures enable more light to reach the sensor. More light always means better autofocus performance, in conjunction with needing lower ISOs to achieve the same brightness. Lower ISO = lower noise. However, larger apertures are often associated with softer looking final images due to multi-directional convergent light rays. 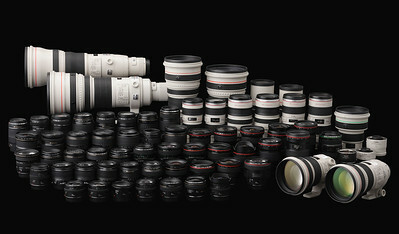 So by now it should be apparent what makes a good lens is very complex, and is associated with increasing costs. What lenses are preferable for certain situations will be discussed in more depth in the final part of this series. In the next part, we will be discussing camera bodies, their design, and the differences between camera systems.